When I came back from holidays, I was lucky enough to still be able to have another two weeks off - I also haven't soaped for at least 6 weeks so the soaping urge was beginning to shout at me! Just before I went on holidays, I ordered some new fragrance oils that I just wanted to try out. One of these was Blueberry - I had tried this in a sample previously and used it in a sugar scrub and just loved it, it smells just like the best blueberry muffin ever. So I had to use this first, I was just dying to ... my mouth watered just smelling it. So I lined up all my ingredients, all perfectly weighed out and mixed carefully. Then prepped my colours - I used Blueberry POP mica (yeah, blueberry, what else could I have used really?! It was just asking for it!). I mixed some with oil in one jug, a little less in another with a tinch of TD to give a paler blue, in a third jug I mixed more of the Blueberry and then added some Grape POP mica to make a really deep bluey/purpley sort of colour. In my final jug, I mixed TD to give a really white soap. So all was good.. the oils were ready, the lye with dissolved silk was ready, the colours were ready, the mould was lined and all my worktops cleared to give me space for my favourite spoon swirl. I mixed my fragrance oil into the oils before adding the lye water, as always and gave it a little stick blend to make sure it was fully mixed. 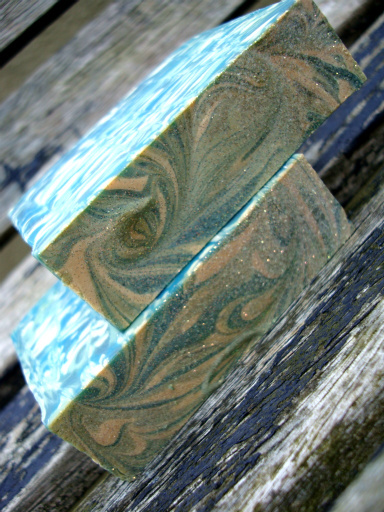 Then I added my lye and mixed everything together - I wanted to make a spoon swirl which is my favourite technique and you have to have the soap at a very light trace so I needed to make sure I didn't stick blend too much. Then it happened .. the FO turned my soap batter into a VERY yellow colour; like neon yellow, I kid you not!!! Ok, not good when I'm using blues as my colours! 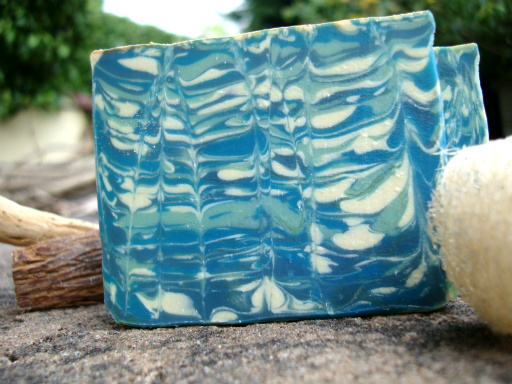 So what to do but to go ahead and make my soap... so I mixed the now amazingly yellow coloured batter into my blues and everything went a pretty green! 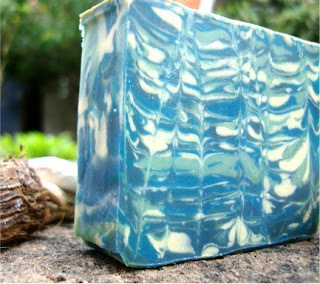 Yep, my green blueberry soap! The colours were fab though so I just went for it ... I did my spoon swirl and it took about 30 minutes. Fortunately I got the soap at the right trace level so I had the time to work with it. Everything was in the mould and I decided to swirl not just the top of the soap, as I normally do, but the body too. 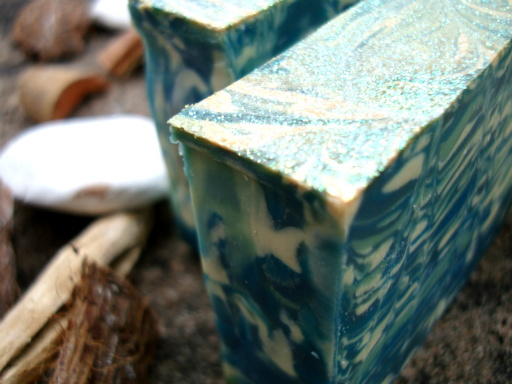 I put my wooden chopstick into the soap and swirled the whole depth of the soap, banged the mould on the worktop a few times to release any bubbles and then sprinkled the glitter on top and popped everything into the fridge. I made this on Monday and it stayed in the fridge til Tuesday morning, then I took it out of the fridge, brought it to room temperature and then took it out of the mould and allowed it to sit, uncut, til this afternoon. And so, here you go, pictures of my Wild Blueberry soap ... it certainly was a wild ride! I really like it and, actually, it has stayed pretty blue for me which I'm happy about. 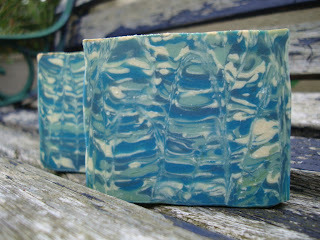 Not sure the swirl on the body of the soap has worked that well though - what do you think? Also I've decided not to use glitter for a while... I've noticed that the tops of the soaps become a different colour from the body and I'm convinced that it's glitter related. It's a pity but I think I'll lay off it for a while and see if it's makes a difference. Hope you like this - if you're interested in having one in your own bathroom, it'll be cured by the end of August. I like it! 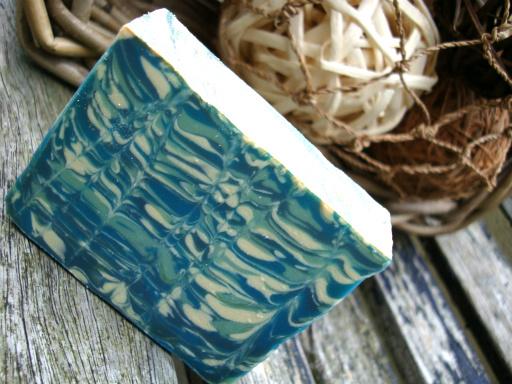 The yellow makes your soap go towards the teal side of blues, but still blue! Your new swirl pattern reminds me of... broken color TV screen, it goes X and Y~ Or I'm not sure if you are familiar with this old sci-fi TV series Outer Limits. Love the layered swirled look you got. Blueberry always smells so good too! Haha I know what you mean about wanting to make soap. Sometimes I get really busy with work and school and never have time. It's really bad when you have a new scent/oil/additive you haven't soaped with yet and are dying to try it out. 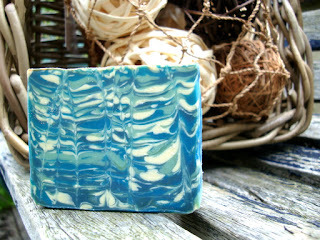 I love how the swirl in this soap turned out!! You are lucky to still have a few of the POPs left. I miss my purple pop... still haven't found a good replacement. Very pretty soap, the colours turned out very well. I like it!! Thanks everyone! I'm so glad that it all calmed down in the end, it was seriously mega yellow. 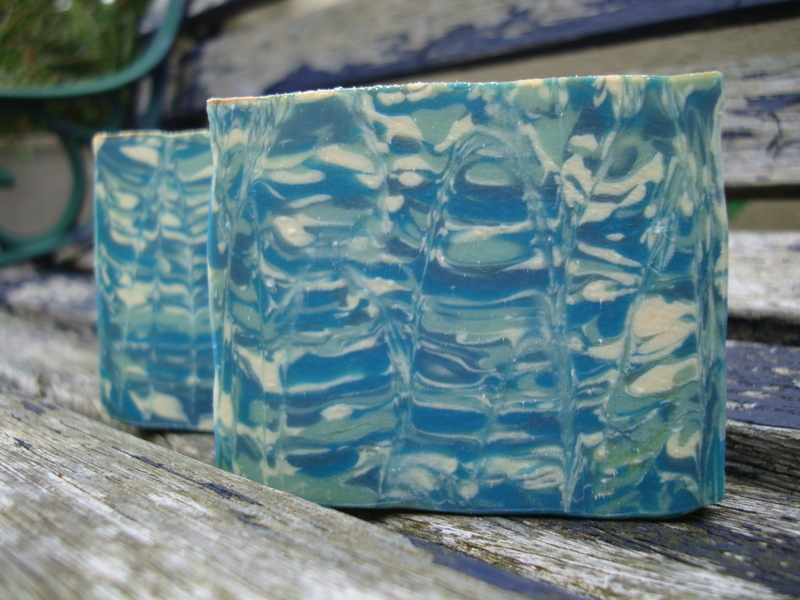 Now the whiter soap is still a little yellow (and should be whiter than white) but I think it does have a lot of blue in it. I'm rather happy with it! Caitlin - I got a good delivery of the POPs and try and not use them TOO much but will have to start sourcing other colours to replace them. Why did they stop making them???? 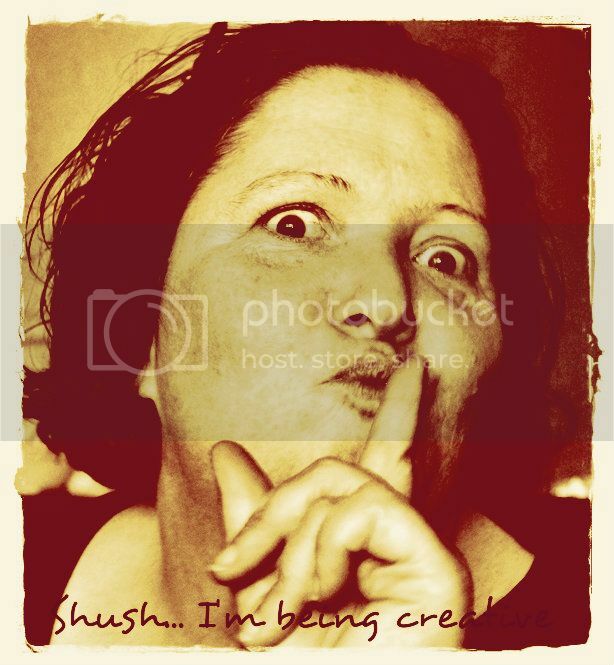 Hi Celine...I am fairly new to your blog. I was reading about your method of putting the soap into the fridge & I am very curious what this does...I usually use the cold process oven process method, so my soap gels...but tell me the benefits of the fridge method. 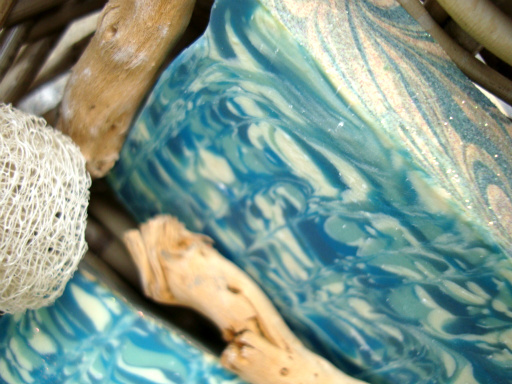 Love the looks of your soap! 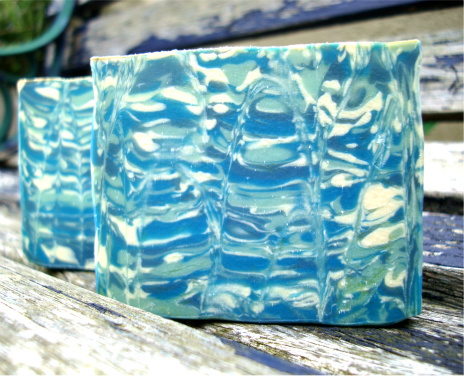 Often times I need to buff off the tops of my soap with a soft washcloth after they are dried to get off the discolored haze back to their originally intended colors. I notice it happens especially with 3 different fragrance oils I use...I think it's a little combination of ash also. 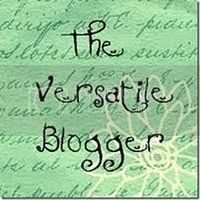 Hi Joan and welcome to the blog! I don't gel my soaps, I prefer the creamier look of ungelled soap - just a personal preference. As you know, some soap gels faster than others, depending on teps used, additives like milk or honey and fragrances used. So I try to soap pretty cool and not add too many factors that'll heat the soap up and then put it in the fridge (I have a little one specially for soaping that my bro gave me!) which keeps the temp down, keeps everything nice and cool and avoids gel or partial gel. The tops could be ash - I know some FOs will cause it more than others; I also got it with a milk based soap. Rubbing them with a cloth will usually help - sometimes the ash actually sort of adds to the design too though. Hope that helps and keep an eye out for more soaps I'll be featuring in the next few days - I just wish the weather was nicer here so I could take some photos!!! Celine...thanks a lot. 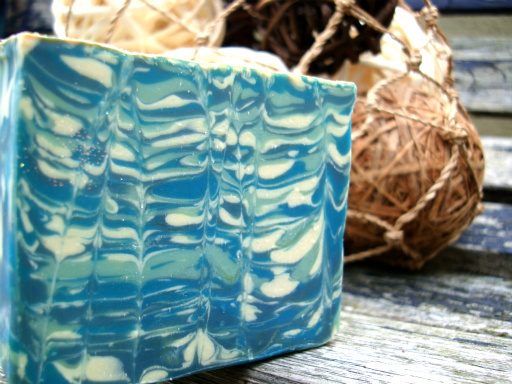 This might be the technique I need with some of my goat's milk soap. 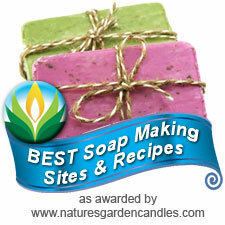 I know the process of soapmaking is very forgiving in so many ways and that experimenting is most of the fun. It certainly could help by keeping the temps low... 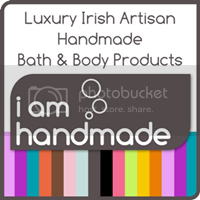 I've not made a milk soap in a while but might try myself! Definitely a veeery beautiful soap, worth the colour trouble.